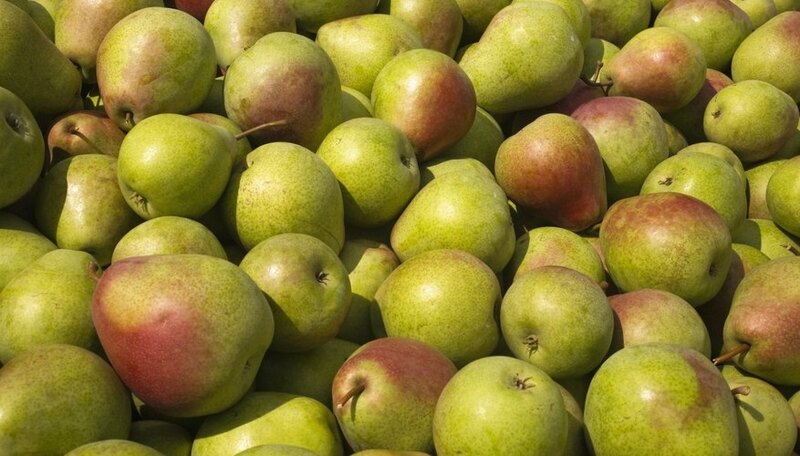 If you’re growing pears, your trees are likely to be affected by insects or disease at some point. Spraying your trees can help to prevent or eradicate such problems. The best plan is to spray for the pests and problems common in your area before you spot signs of trouble. Being consistent and following a schedule will protect your trees and the fruit. Wear a shirt with long sleeves, long pants, rubber boots and rubber gloves. Use a face shield or goggles and a hat. Take a shower or wash yourself thoroughly after you’re done spraying. Wash all protective equipment and clothing separately from other items. Never spray when it is windy. Spray in the early morning or in the evening, when the weather is often calm. Always follow all label directions. Keep chemicals in their original, labeled containers and placed where pets and children can’t get to them. Choose a day to apply dormant oil to the trees during the late winter or early spring months to control scale, insects, mites, aphids and pear psylla. Don your protective gear before you begin spraying. Spray the entire tree thoroughly to kill pests hiding in cracks in the bark of the trunk and branches. Use a handheld or motorized sprayer, and apply the spray on a day when the spray will dry quickly. When the dormant oil has dried, spray with a fungicide and antibacterial Bordeaux mixture to control fire blight. It’s time to spray for pests when the buds begin to push out green tissue that’s no more than 1/2 inch long. If you didn’t apply dormant oil earlier, use it now. Apply neem oil to kill leafminers and aphids, and use permethrin to control pear psylla. Spray with sulfur or myclobutanil to control primary scab. Commercial combination sprays can make it easier to apply multiple products in a single application. The next time to spray your pear trees is when you can clearly see the blooms but the flowers haven’t opened yet. Spray again with the same chemicals to control aphids, pear psylla and primary scab. The permethrin for pear psylla also controls stink bugs and plant bugs, and the sulfur or myclobutanil not only treats primary scab but also controls rust and powdery mildew. Once the trees begin to bloom, don’t spray any insecticides because they not only kill pests but also kill bees and other beneficial pollinators. When about a quarter of the pear blooms have opened, repeat spraying with sulfur or myclobutanil to keep rust, powdery mildew and primary scab in check. Also spray with streptomycin for fire blight. Once most of the petals have fallen, spray your pear trees with the same combination of chemicals that you used just before blooming. This spray controls aphids, pear psylla, plum curculio, leafrollers, stink bugs, plant bugs, leafminers, rust, powdery mildew and scab. Continue to spray the same chemicals every 10 to 14 days throughout the growing season until 14 to 30 days before harvest. Add malathion or spinosad to control codling moths. The type of equipment you use depends on how many pears trees you want to spray, as well as how big they are. A handheld pump garden sprayer handles most jobs. If you have a lot of trees or if they are tall and the pump sprayer won’t reach the tops, rent or buy a motorized sprayer, which has a lot more power. Thoroughly rinse out all spraying equipment after each use, including the tank, hoses and nozzles, and let everything dry out. Chemicals used to spray pear trees may be corrosive, and these can destroy a sprayer in just one season if they are not cleaned out every time. In addition, chemical residue left in a sprayer mixes with the next spray put into the tank and can possibly harm your trees. Spray stored in a sprayer tank can also break down, rendering it useless for further applications. How Far Does an Ortho Tree Sprayer Spray? When in the Year Do I Use Liquid Seaweed on My Apple Tree?